Australia, with its huge landmass and friendly people is very inviting for a long visit; most cruising destinations are along the East and Southeast coasts. Brisbane Area - the port of entry is at Scarborough and marinas exist within the city center, Manly to the south and Mooloolaba to the north. Bundaberg - port of entry with a couple of marinas and pile moorings on the river near town center - no info at moment. Darwin - port of entry with 20-24' tides, several marinas behind locks and a couple of inconvenient anchorages. ...take a look at the map: provided is destination information for Brisbane, Scarborough, Mooloolaba, Cairns, Darwin as well as coastal anchorages from the Great Barrier Reef to the Top End, ports of entry are shown in blue and others are in red! Check-In Procedures - The following procedures applied when we checked into Brisbane in Nov. 1998. The Immigration, Customs and Ministry of Agriculture and Fisheries (MAF) officials will visit your boat, usually in this order. Until check in is complete, no person should leave the boat. The MAF official, although very nice, will probably confiscate all your fresh fruits, vegetables, meats and some canned and dairy goods. He will also remove your trash. You can usually get a complete list of prohibited items from any Australian High Commission prior to entry. If you move to another location later, you must notify customs of you intended destination. This can be done at the time of check in or by phone later on. Before leaving the current area for other parts of Australia, you must notify Customs and obtain a cruising permit (free) to cruise the coast either north or south. When stopping at any other port of entry (eg. 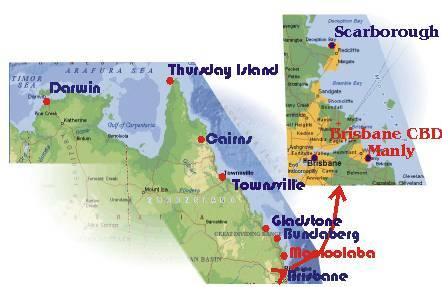 Gladstone, Townsville, etc. ), you must again notify Customs of your arrival in their port. This can be done by phone or VHF radio after you arrive. There should be no visit or paperwork, they just want to know that you are there. No need to call them when leaving the port. Refund of GST - Unfortunately, the Australian government does not issue GST refunds to yacht masters or crew as the rules now only cater for those tourists who leave by plane or cruise ship. They are looking into how to changes these rules.